We convened 45+ strategy leaders for breakfast across the country representing Fortune 500 companies in Boston, New York, San Francisco, and Silicon Valley. Several themes emerged from these conversations including organizational alignment, team size, talent sourcing and the role of strategy in the innovation process. One theme that organically arose at all sessions was that tension inevitably arises between corporate strategy teams and business units. What was less clear was how to handle this tension. To distill that notion, it’s essential that corporate strategy groups make a cognizant effort to go into initial meetings with an open mind and spirit of learning. Immediately “calling a business unit’s baby ugly” without a clear understanding of the realities facing the business unit is a sure way to start things off on the wrong foot. Whether the corporate strategy group agrees with the choices that the BU has made or the direction the team is proposing at the offset, strategy teams need to have the humility to say, “I am not in the business unit”, and start by understanding the team’s perspective before providing feedback or suggestions. While it can take time to develop trust, corporate strategy teams have the opportunity to learn more about that business unit and its direct challenges beforehand. These perspectives can also help your team drive enterprise strategy. We work with several of our clients in these groups to connect them to former members of the business unit they are about to serve. This person is able to paint a picture of the challenges or opportunities they see within the group, which the corporate strategy team can use to feel more in tune with the group off the bat. Representatives from corporate strategy teams we met with expressed the importance in developing the skill of saying ‘no’ to a portion of the requests they receive from business units. One executive estimated that 80% of the requests are fielded as background noise, with 20% of requests acted upon and served. Since many internal consulting groups are between 10–30 people in size and serving companies with 10,000+ employees, teams have to select projects that they can both successfully drive impact on as well as those that align with the strategic vision of the company. It is essential that for the projects they do choose, corporate strategy and internal consulting teams are able to fully own those projects they take on and provide the most value to the teams they are serving. A few groups lamented that often they will work with a business unit for several months and that despite doing so, there is a lack of trust in the insights they deliver. BU leaders say that because the corporate strategy group is employed by the same parent company as the business units, the group is not providing enough of an external perspective to the challenges the team is facing. To address this issue, strategy groups work with AlphaSights to speak with subject matter experts who can validate their findings before they present to the BU leaders. The added citation — or several — of a well respected senior executive in the industry supporting the recommendations the internal strategy group is providing goes a long way and can help add assurance to findings. We heard from attendees that they struggle to fight against the strategy vacuum that many F500 corporations face. The concept refers to situations in which the strategy stays too high level and thus feels inaccessible to business unit leaders. Several attendees who sit in the business units voiced frustration for systems that leave them out of the company-wide discussion. Since they are in the weeds each day, they feel that they’re able to see opportunities for improvement and can form ideas for new products more organically than a high-level corporate strategy team might be able to. One of our attendees revealed that his company recently started an accelerator program for business units to submit ideas for improving current products or creating new ones. An accelerator panel made up of both corporate strategy team members and business unit leaders would then review the idea. 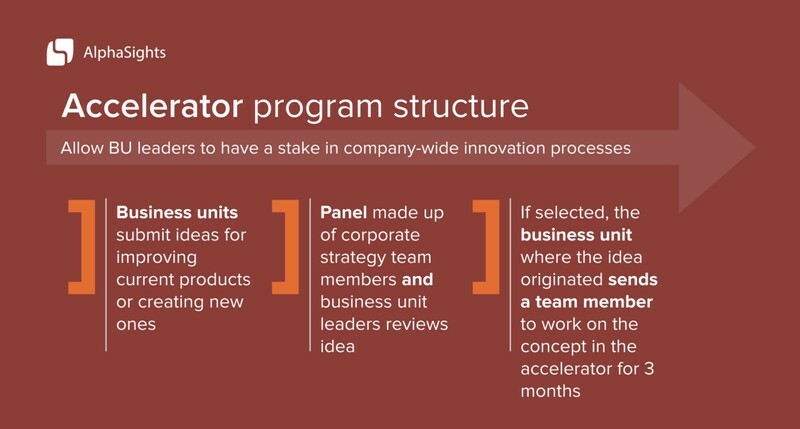 If selected, the business unit in which the idea originated would send a team member to work on the concept in the accelerator for three months. This system allows business unit leaders to not only make suggestions, but also have a stake in the company-wide innovation process. A few of our clients have also adopted the accelerator program model and bring AlphaSights into their process early on so they can quickly pressure-test the new ideas against industry sector experts and the market perspective. They will use these initial calls to vet the ideas, determine market opportunity, and estimate a potential return on the investment. If they do decide to pursue the idea, they will continue to leverage AlphaSights calls to keep tabs on the industry and to see if any of their competitors have begun adopting similar product strategies. 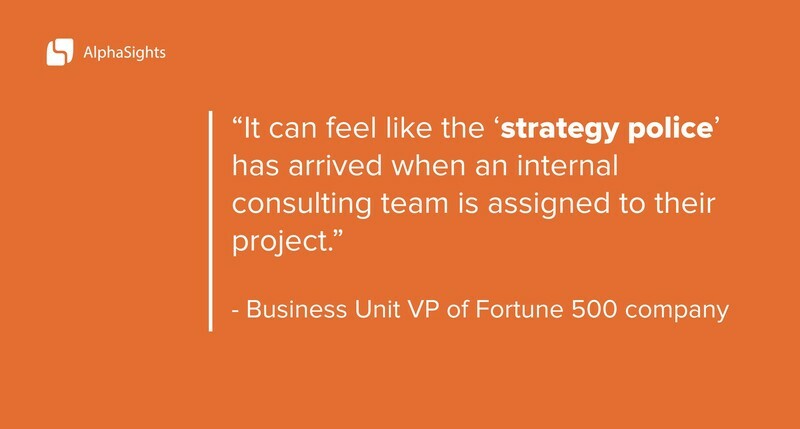 Fortune 500 corporate strategy leaders face tension with their internal business units, but it doesn’t need to be this way. By developing trust, building a positive reputation, and leaving room for innovation internally, corporate strategy and internal consulting teams can not only work with business units, but can thrive together and develop new innovations that have the potential to open new lines of revenue. Sloan Danenhower is Vice President of Client Acquisition at AlphaSights. He is responsible for bringing the use of knowledge search to the Fortune 1000. Under AlphaSights’ service model, teams connect clients with custom recruited, industry specific experts who answer their toughest research questions, help validate their hypotheses, and identify opportunities that may have otherwise been missed.